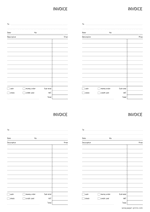 Invoice or billbook with 4 times an invoice on an A4 size paper in a vertical, portrait orientation. Empty space for your stamp on top and easy to cut in four pieces. Invoice or billbook with 4 times an invoice on a letter size paper in a vertical, portrait orientation. Empty space for your stamp on top and easy to cut in four pieces.